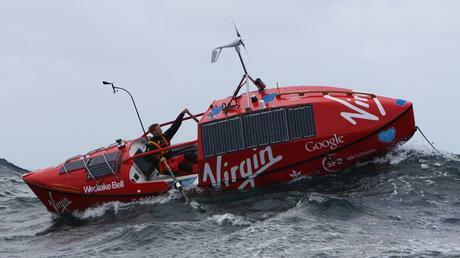 Way back in 2009 I followed British adventurer Olly Hicks as he made an attempt to row the Southern Ocean, circumnavigating Antarctica in the process. That expedition was fraught with challenges and Hicks ended up spending three months at sea without really putting a dent in the milage he needed to complete his journey. He ended up pulling the plug soon thereafter, but has never quite been able to shake the idea of going back to this massive undertaking, even announcing plans in 2012 to try again. Now, more than six years later, he's prepping to give it another go. Hicks has announced that he'll once again attempt a solo row around the Southern Ocean, which he says will be the longest such journey ever undertaken. The plan is to set off from Australia later this and begin rowing in an easterly direction. The entire trip will cover approximately 18,000 miles (28,968 km) and he expects it will take roughly two years to complete, including a 2-3 month stopover on South Georgia Island where he'll wait out the Antarctic winter. Olly's approach to the expedition is a bit different this time out, as he now plans to have a support ship with him to shadow his progress and lend assistance should the need arise. That vessel won't just be hanging out in the Southern Ocean however, as it will also be on a scientific mission to study the the current health of plankton in the Southern Ocean. To prepare for the "Row the World" mission, Hicks will first warm-up by rowing from mainland Norway to Svalbard in the Arctic Ocean. From there, he'll embark on a 20-city tour, along with his rowboat and scientific support vessel that will end upon his arrival in Australia. Along the way, he hopes to host a series of educational events to not only introduce his plan to row the Southern Ocean but also talk about the science he and his team will conduct while there. Those events will hopefully raise awareness of his plans and may serve as fundraisers to help support the expedition too. There is no firm date set for when Hicks will begin his Southern Ocean challenge, but I'd predict that it will launch sometime in October or early-November in an attempt to get a jump start during the Austral summer. That season is relatively short, so he'll want to make as much progress as he can prior to the return of winter. To find out more visit OllyHicks.com. Olly Hicks Showreel from Olly Hicks on Vimeo.